Bit more than a mate: Stubbsy of course being one of my oldest friends, veteran of the arsequake trenches, etc. This is his latest book and is out in a couple of weeks on zer0, who you might have noticed has done a trawl through this corner of the bloggosphere, scooping up a large swathe of the talent. 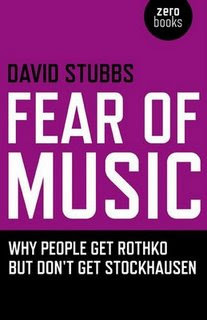 Not being in German, Fear of Music I've actually read, and it's a brilliant, thought-provoking investigation into why modernist art is happily lapped up by the middlebrow masses whereas its counterparts in avant-garde music--your Boulezes and Nonos and Parmegianis--are vastly less palatable to the general public.